Many schools report increased learner engagement and improved progression when using the teaching approaches and lesson materials developed on our programmes. Enhanced critical thinking, more user-directed learning and better academic performance are frequently cited as benefits of an approach that actively engages students in thinking through the profound issues raised by the Holocaust. The Centre for Holocaust Education’s commitment to using research to inform classroom practice has had substantial impact in English classrooms. Its professional development programmes are highly regarded and have benefited thousands of teachers, and an estimated 1m pupils have experienced a deeper emotional and intellectual engagement with this difficult subject. The current CPD programme was developed in response to our landmark 2008-9 research project Teaching about the Holocaust in English Secondary Schools: an empirical study of national trends, perspectives and practice, which identified that many teachers recognised the difficulties in teaching this subject and wanted additional support. Systematically collected feedback reveals a very high level of satisfaction with the CPD and evidence of a powerful impact on teaching and learning. Most notably, 84% of the participants rated the quality of the programme as ‘Excellent’ with the remaining 16% rating it as ‘Good’. A 2011 survey of CPD alumni provided evidence of widening impact with 91% of teachers saying that they shared resources and ideas from the CPD with colleagues back in school. “The Centre’s workshop on pre-war Jewish life was a light bulb moment – a revelation. I realised that I had never delivered a genuine contextual lesson on the Holocaust before,” writes Leanne Judson, Head of Humanities at Broadgreen International School, Liverpool . “I used the Centre’s approaches and classroom resources to set about changing the way the Holocaust was taught and created a pilot scheme with five classes. The response from the pupils was overwhelming. 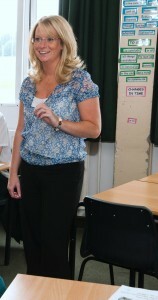 “The ‘Interactive timeline’ lesson was outstanding. It provoked so many enquiry questions from the pupils. One class in particular – bottom set, Year 11 – having created the timeline, asked: ‘So Miss, when did it really start? I responded: ‘Figure it out – have a look. When do you think?’ This then generated a whole debate with pupils discussing, even arguing, among themselves and forming their own judgements based on the evidence provided in the form of case studies, micro histories, key phases in Nazi anti-Jewish policy and date cards. “At first some colleagues didn’t want to abandon the old ‘shock and awe’ approach. But I had pupils from other classes asking if they could come and do some work with me and this was the catalyst for change for the whole department. Seeing the impact on the pupils’ learning and the depth of their understanding was superb. Tony Cole is a teacher participating in the Centre’s Beacon Schools Programme. He describes the impact of the ‘Authentic encounters’ resource on a group of students who struggle to engage with learning. “CSS South provides for young people in Key Stage 3 and 4 who, for various reasons, are unable to attend mainstream school. The majority of the young people who attend the service have been or are in danger of being permanently excluded. In most cases this has been due to social, emotional and behavioural difficulties. “I am currently working with a cohort of four year 11 boys all of whom have not attended mainstream school for well over a year. The boys all have difficulty in engaging in the school curriculum and as such efforts to do so require extensive differentiation. “This year the boys opted to study Unit 14: Germany, 1919-1945: Race and Youth, which requires the learner to investigate how and why the Nazis were able to persecute the Jews and to be able to demonstrate knowledge of the key aspects of the Holocaust. “I wanted to move the cohort towards the Centre’s model of teaching about the Holocaust rather than to take the safe option of graphic images and scenes from ‘Schindler’s List’. However, my previous experience of teaching this group was that if the pedagogy failed to engage them it was a long haul to win them back! I decided that I needed to take the risk and prepared a lesson using the Centre’s resource ‘Authentic Encounters’. “My anxieties were short lived. The group engaged in the lesson in a manner beyond my wildest dreams. I measure this from two angles. One, by the intensity of the thought and insight from the boys. They became deeply enthralled with the story and the plight of the Greenman family. “Second, and perhaps more surprisingly, by the emotional response that it triggered. The boys were visibly moved by the story. No graphic images, no Hollywood interpretations. It was the humanistic approach that they struggled to deal with emotionally. They were quite simply overwhelmed by the power of the story. “It brought home to them the reality of the Holocaust and that it was not merely an event in history, that it devastated lives, families and a whole culture. They had become hungry to learn, wanting to hear further testimonies. This allowed me to introduce selected text from ‘Hidden Voices’ as well as extracts from ‘This Way for the Gas, Ladies and Gentlemen’.